The Gay Gamer: Guess what magically appeared on my doorstep yesterday afternoon? Guess what magically appeared on my doorstep yesterday afternoon? If you guessed "a used PSP," pat yourself on the back! Remember that deal I mentioned a few days ago--the one that fell through? Well, it, uh, un-fell through--and I'm now the proud owner of the sharp-looking PSP system seen in the photo on the right. I rarely buy used game systems, especially handhelds (most people don't treat their screens very well, and I hate scratched screens), but I made an exception in this case because I'm completely unwilling to pay $169.99 for a new PSP. I don't have any games at this point, but I plan on buying Half-Minute Hero as soon as I'm able--and Holy Invasion of Privacy, Badman 2 (which I refuse to call by its new name, What Have I Done to Deserve This, My Lord!? 2) as soon as it's available. Oh, and I'd really like to pick up Patchwork Heroes at some point, too. 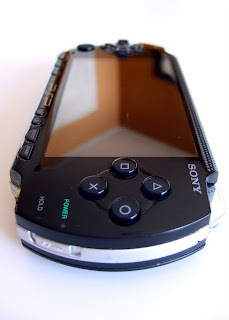 For now, though, I'm content to sit and stare at my shiny, game-less PlayStation Portable system. SUH WEET! That's pretty friggin' cool!